Have you have ever felt like you needed to say yes to everything or you're afraid of missing out on an event or an opportunity because it seemed like everyone else was going to it or doing that thing? This episode is for you! We're talking all about the value of niching down your events and even saying no sometimes. Katie Hunt is joining us to give her expertise in this area. She is a speaker and a conference host who has hosted 15 of her own live events. 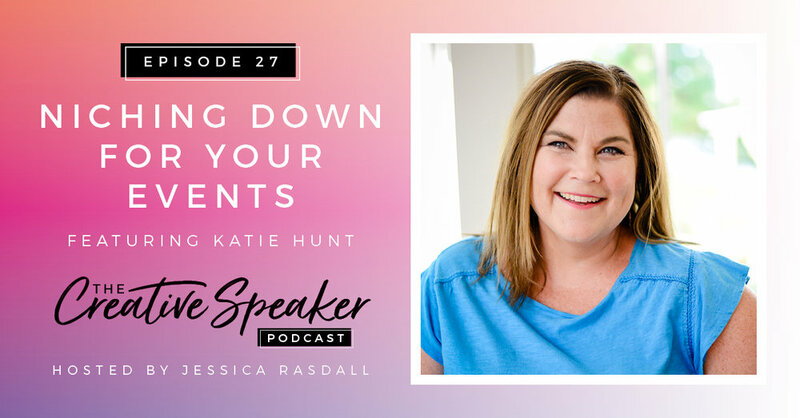 She brings a fresh perspective to the table about being selective with who you're serving and whether that's for your own event or events that you're speaking at. So if you're not sure what events you should be saying yes to you or how to gauge when it's the right fit for you, grab a pen because this episode is for you, my friend. Depth of knowledge is more important than the amount of exposure someone has. Say yes to events that are very on point with your business. It is important that you serve an audience you are excited to get in front of because they are your core audience. When you get to know your audience so well, you can speak directly to them. You can speak to their pain points and can provide solutions that work for them. You don't have to be everything to everyone. So pick two or three topics that you feel passionate about and are very knowledgeable about. And make sure that you're telling everyone and anyone that these are what I speak on so they know what your niche is.